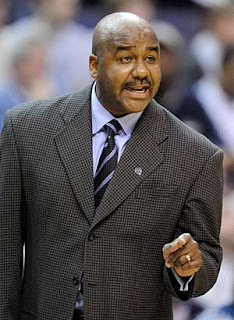 NORTH AUGUSTA, S.C. – Only a few months have passed since Georgetown’s shocking first-round loss to Ohio in the NCAA Tournament, but John Thompson III seems to have put it in his rear-view mirror. After a disastrous 2008-2009 season in which Georgetown went 6-14 in its last 20 games, the Hoyas bounced back a year ago, going 23-11 and earning a No. 3 seed in the NCAA Tournament. The upset loss in the Big Dance notwithstanding, the Hoyas are hoping to continue their winning ways this season, losing just one starter from a team that came two points away from winning the Big East Tournament Championship. Of course, the aforementioned lone starter not returning is Greg Monroe, a versatile 6-foot-11 center who left the Hoyas after his sophomore season. Monroe, who averaged 16.1 points, 9.6 rebounds and 3.8 assists last season, garnered first-team all-Big East and third-team All-American honors, and was also a lottery pick in the NBA Draft. Thompson III knows the enormous void that Monroe is leaving behind. From a production standpoint, the scoring load will likely fall to the perimeter players, led by seniors Chris Wright and Austin Freeman, and junior Jason Clark. All three averaged in double-figures last season, with Wright and Clark starting every game and Freeman starting 32 games. Freeman struggled in the postseason, shooting just 43 percent from the field and 19 percent from three-point range in the Big East and NCAA Tournaments, after hitting better than 52 percent and 44 percent, respectively, during the season. 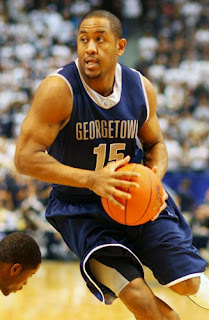 Wright, who Thompson III called the team’s leader, has improved his scoring, rebound and assist numbers every season at Georgetown, while Clark is a three-point shooter and the team’s best defender. Outside of those three, former Florida State transfer Julian Vaughn also returns after starting every game a season ago. 6-foot-11 junior center Henry Sims has played sparingly in two seasons with the Hoyas, but he might be the man to replace Monroe. The sophomores – Hollis Thompson, Jerelle Benimon and Vee Sanford – will need to increase their consistency after providing sporadic production a season ago. Either Benimon or Thompson, both 6-foot-7 forwards, could find himself in the starting lineup. The freshmen class is one of the best in the Big East, headlined by 6-foot-8 forward Nate Lubick and 6-foot point guard Markel Starks. Raw big man Moses Abraham and 6-foot-5 scoring wing Aaron Bowen round out the class. All four are expected to see significant minutes during their first year at Georgetown. Although the Hoyas only lose Monroe from last season, his versatility and all-around talents were perfect for Georgetown’s offensive system. No single player can emulate Monroe’s role in the offense, but Thompson III does not foresee a noticeable change in how the Hoyas play. Georgetown will have more options than last season, when just seven players logged double-figure minutes and four players averaged more than 33 minutes per game. Perhaps the Hoyas’ late-season swoon, in which they lost four of their final six regular-season games, could be attributed to tired legs. With so many talented upperclassmen ready to step in, fatigue should not be a problem this season. Not surprisingly, Thompson III is optimistic about the upcoming season – he feels Georgetown has the pieces to be a better team than a year ago. “That’s the plan,” he said.